All aerial parts of the plant (stem, leaves, flowers) are used together. The dried plant is less aromatic than the fresh one. The content of essential oil is rather low (0.3 to 0.9%); it is mostly composed of cineol, β-pinene and a variety of bicyclic mono­terpene derivatives (L-pino­camphene, isopino­camphone, pino­carvone). As many other plant of the mint family, hyssop contains rather large amounts of bitter and anti­oxidative tannines: Phenols with a diterpenoid skeleton (carnosol, carnosolic acid), depsides of coffeic acid (= 3,4-dihydroxy­cinnamic acid) and several triterpenoid acids (ursolic and oleanolic acid). Very similar or the same compounds have also been found in sage and rosemary. For more information on bitter taste, see zedoary. The Greek plant name hyssopos [ὕσσωπος] is probably derived from Old Hebrew esob [אזוב] (men­tioned in the Bible, see pome­granate), although esob most probably referred to a local variety of marjoram, not the plant called hyssop today. Probably, Arabic az-zufa [الزوفا the hyssop belongs to the same kin; cf. also modern Kurdish zufa [زووفا]. 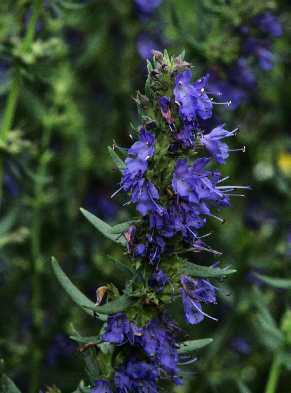 Hyssop, an attractive garden plant with dark blue flowers, has only small value as a spice, because the aroma is weak (and reduced to nil after drying), and its taste is rather bitter. It can, however, be used for robust, rustic dishes like potato or bean soup, and it goes well with fat meat; others suggest it to spice up calf and chicken, where it may be an interesting alternative to sage, whom hyssop resembles in its slight bitterness, but not in fragrance. Sometimes, hyssop is added to bouquet garni (see parsley).